This dental health message from Designer Smiles in Fargo is a reminder that in spite of appearances, your teeth are living, breathing things. Since teeth don’t grow and the enamel is not comprised of living cells, sometimes we forget that they are alive. Toothaches tend to remind us of this. Like other organs, teeth need a blood supply to stay alive and healthy. Sometimes root canal therapy is necessary to save a dead tooth. During a root canal, the soft tissue in the root of the tooth is removed. Once the roots are cleaned out and widened, they are filled with a special rubber material. The final steps are the core build up and a new crown. 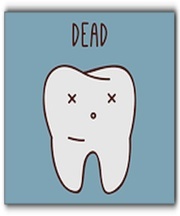 How do you know if you have a dead or dying tooth? It is vital to communicate with us if you experience tenderness or pain, hot or cold sensitivity, tooth discoloration, tooth injury, gum swelling, gum pain, or lymph node tenderness or drainage. At Designer Smiles in Fargo, it’s all about dental health. Our services include general and cosmetic dentistry. Schedule your next checkup today!